Can Henderson stop De Bruyne again? Two of the Premier League's most lethal attacks meet on Saturday as Manchester City host Liverpool at the Etihad Stadium. 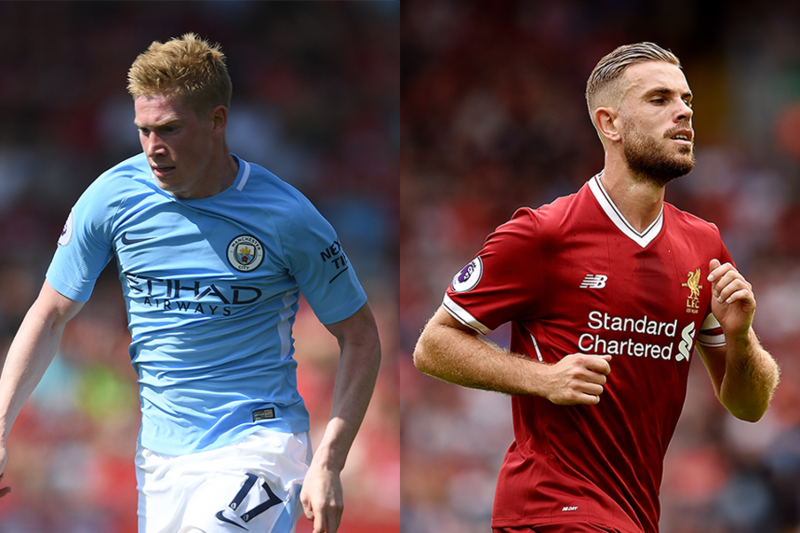 But the winner of these free-scoring forces will likely be decided in a midfield battle, writes Sky Sports’ Matt Cheetham. Following the arrival of Bernardo Silva and the impact of Gabriel Jesus, Pep Guardiola has opted to deploy Kevin De Bruyne in a deeper role. This has meant that instead of having between one and three players ahead of him, the Belgian is suddenly playing with around four and six. With more options ahead he is making more of an impact in dangerous areas, despite his deeper position. His total of 46 final-third passes against Brighton & Hove Albion was higher than in any match last season - suggesting he now has a better platform to operate from. For Liverpool to succeed on Saturday they must find a way of punctuating the continuous passages of play controlled by De Bruyne - a task falling under the remit of their captain. Jordan Henderson is Liverpool’s focal point in possession (he has already made far more passes than any team-mate this season) but his off-the-ball contribution will be even more important against De Bruyne. He has the skillset to nullify his opponent. Henderson has covered more ground than 339 of the 346 players to play in the Premier League this season. He has also recorded more tackles and interceptions than any Liverpool midfielder, regularly mopping up possession and springing attacks. That combination of attributes should allow Henderson to play a combative role on Saturday, staying close to his opposite man and hurrying him as he did last season. In Liverpool's 1-0 win over Man City in December, De Bruyne failed to create a single chance from open play. It was the only time he failed to do so in a 90-minute performance all season and his 57 touches were also his fewest in a full match. Liverpool remain unbeaten against Manchester City under Jurgen Klopp, winning three of four fixtures. If Henderson can frustrate De Bruyne as he did in December, his side have a strong chance of extending that run.